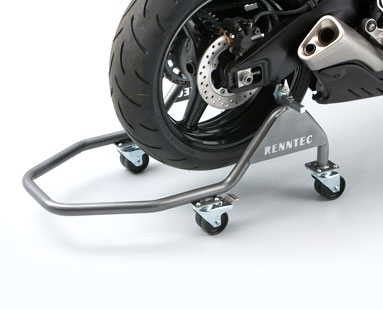 Renntec Moovamoto™ Paddock Stand is designed to be used in the Commercial Workshop, Home Workshop / Garage, or a Racing Environment (Paddock). 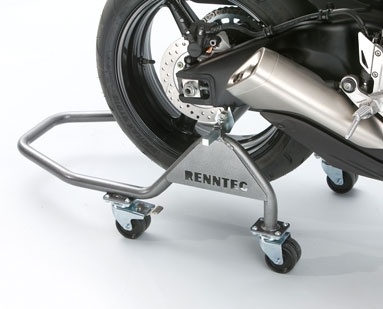 The Moovamoto ™ works as a traditional paddock stand, however, unlike traditional paddock stands you have the added ability to move the motorcycle in all directions with the rear wheel off the ground, or even with the rear wheel removed. 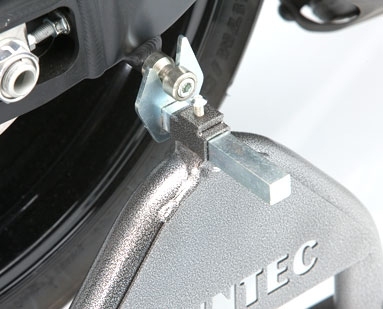 The Shape of the Moovamoto stand allows access to enable you to maintain your motorcycle with ease. If you are short of space or need to move a motorcycle in a confined space then the Moovamoto ™ is ideal. Note: Please check if you require Hooks or Cups before placing your order. Every Moovamoto Stand is supplied with either Hooks or Cups, additional Hooks or Cups can be purchased if required. There are no reviews for this Item - You must Login or Create an Account to post reviews.